Heating with wood can reduce home heating costs – but accurately forecasting the cost reduction is a challenge. The major share of the lifecycle cost of a wood heating unit is the cost of a new unit, supplementary materials/tools, and installation. Potential cost savings arise when an inexpensive source of suitable wood fuel is available. However, there are factors that complicate the discussion of the economic benefits of wood heat installation. The following are a few of those complicating factors. Local ordinances influence the economics of wood heat in three ways. First, local emission standards may dictate the type of the unit allowed and the installation cost. Second, local ordinances may dictate when the unit can operate. This is especially true for new wood heating units (homes that had wood heat as a primary heating source prior to the ordinance may be exempt.) For example, an area prone to inversions may restrict burning for many days during the cold season, thus the economic discussion of wood heat must consider both the inability to use the unit during peak cold times and the cost of having a redundant fuel source (natural gas, electricity or propane) operating for that period. Third, local regulations in building codes may affect the cost of installation. Wood can be gathered by the homeowner or a third party can deliver the wood. Third party delivery prices will vary based on distance to the wood resource, type of wood, costs of transportation, and the condition of the wood (split or round). In some areas, local saw mills will sell truckloads of “ends and pieces” or logs that are not saleable for the mill, but work well for burning in the home. These loads may cost less than cut and stacked wood that is gathered from the forest, but also may require additional processing such as cutting, splitting and stacking. The cost of cutting your own firewood will depend on the homeowner. Someone who already possesses a saw and safety equipment, has the skill and physical ability to cut down trees, and has the ability to transport wood may find wood heat a reasonable option. Alternatively, buying equipment and learning how to use it safely may add thousands of dollars to the expense of using wood for heat. The opportunity cost (you could be doing something else with your time) is also important to include in accurate assessments of economic viability. Gathering, splitting, and stacking firewood is a time consuming process. If you consider preparing your supply of wood as recreation, your opportunity cost may be quite low. If you would rather be fishing (or working overtime at your regular job), then it may be high. Your ability to conduct this type of hard physical labor may also change as you get older. Some homeowners opt to pay a premium for delivered firewood to reduce the amount of physical labor required to burn wood. The cost per cord will increase if the wood is cut, split, and stacked. While it is difficult to provide accurate average costs or return on investment information for wood, understanding the number of heating days and the amount of heating demand in the home can help in understanding the potential savings or cost. Fuel demand for space heating varies according to the temperature outdoors. “Degree-day units” help in estimating the heat requirements and fuel costs for a building. Heating degree-days are a way to estimate heating costs. A heating degree-day is the demand for energy needed to heat a building for one day. When the outside air is above the base temperature of 65° F, no heat is required. To determine heating degree-days, the average daily temperature is subtracted from 65° F. Each degree accounts for one degree-day. Example: if a day’s High temperature is 50° F and the Low is 30° F, the average daily temperature is 40° F. Subtracting 40° F from 65° F results in 25 degree-days for that day. Heating demand is directly proportional to the number of degree-days in a year. Economic discussions are further complicated based on the role that wood heat will play in the home. Some of the factors that make it difficult to provide an “average” economic benefit include: The floor plan of the home and where the stove will be located (i.e. – if the home has a basement, but the stove will be on the ground level, the heat may not be able to easily circulate to the lower level). In addition, consider if wood heat is a supplemental or primary source of heat, and the additional time required to use wood heat, as fuel needs to be constantly refilled and there is a “start-up” delay from when you start your unit and when it actually starts to heat the house. Averages can be provided based on fuel substitutions. In North America, heat value (energy content) of fuels is commonly measured in BTU (British Thermal Units), which is roughly defined as the amount of energy needed to raise the temperature of 1 pound of water by 1°F, or in “therms”, where 1 therm equals 100,000 BTU’s. 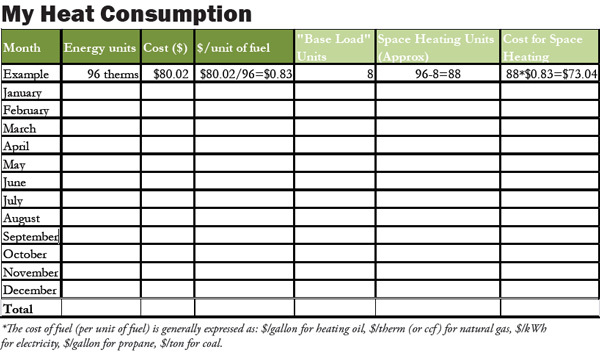 A Fuel Value Calculator, published in cooperation with the USDA Forest Service, Forest Products Laboratory, and the Pellet Fuels Institute in Arlington, Virginia, is a tool that can be used to compare typical unit costs of various fuels and is available online at http://goo.gl/wP8kR. 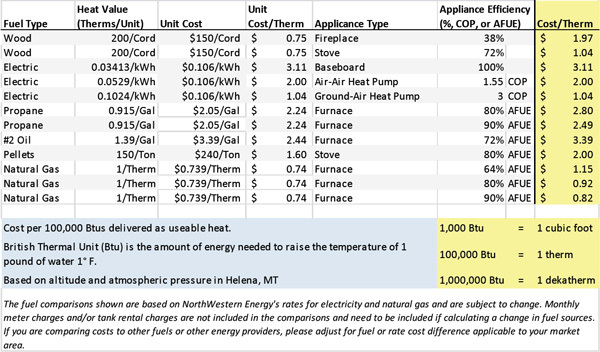 The following is an example for a Fuel Heating Cost Comparison for October 2013 in Montana, provided by NorthWestern Energy, a major utility. A similar cost structure and combustion efficiencies can be assumed for Wyoming. Using some of the above numbers and assuming 50 Million BTU’s/500 therms for annual home heating demand, a household in Montana or Wyoming would pay approximately $1,560 for fuel oil #2, or $480 for natural gas, or $1,550 for electric heat, or $1,320 for propane, or $640 for purchasing cordwood, or $1,000 for buying wood pellets. An online comparison calculator is available here: http://goo.gl/lhNmqC. Obtain a 12-month fuel usage history. This information will come from different sources depending on the existing heating system. For example, if the home is currently heated with a propane-based forced air heating system, the information will be available from the propane supplier. Conversely, contact the electrical utility if the home is currently heated with electric baseboard. Some utilities provide this history online or in monthly statements. The utility should be able to provide estimates based on energy usage for similar homes in the area if new construction is planned. Enter the amount used per month (this may require some division if the home is not billed monthly) in the table above. Find the cost per energy unit. Use the table above to calculate the amount of energy used and the average cost per energy unit for the 12-month period. If your home is all-electric, i.e. 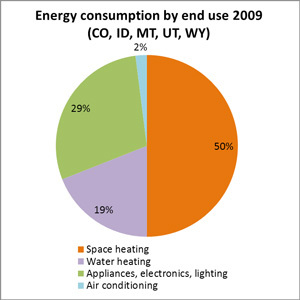 space heating is provided with electricity, assume that on average about 50% of the energy consumed in a Montana or Wyoming home annually is for space heating. So about half of your annual bill would be the demand and cost allocated to space heating. Because most people don’t meter their space heating separately from other end uses, a more involved calculation is necessary for a more accurate estimate. Assuming natural gas is used for heating, find a month (or the average of two) with the lowest natural gas consumption on the utility bill. This should be a summer month, when no or very little energy is required for space heating, and establishes a “base load” from water heating, cooking, etc. After subtracting this amount from the natural gas consumption of any other month the balance should provide a fairly good estimate of the amount consumed for space heating. A general rule of thumb for annual consumption could be to assume 20% of natural gas consumption for domestic hot water heating.Multiply both the total usage by month and the cost per month by the percentage used for space heating (see the example at left). Once you understand your space heating costs and have discussed realistic estimates for the percentage of space heating demand you can offset with wood with a qualified installer, you can begin to assess both the total costs of the system and some simple return on investment calculations. A federal biomass heating tax incentive is available, which provides a tax credit up to $300 for the purchase of a biomass burning appliance, including pellet stoves, with a thermal efficiency rating of at least 75%. The Residential Energy Efficiency Tax Credit is for purchases/installations made in 2012, and 2013 (http://goo.gl/1x1s). Residential Alternative Energy System Tax Credit (personal tax credit), including for low-emission wood stoves, and biomass. Maximum Incentive is $500 per individual taxpayer or up to $1,000 per household. The State of Wyoming does not offer any incentives for the use of wood for residential or commercial heating systems.